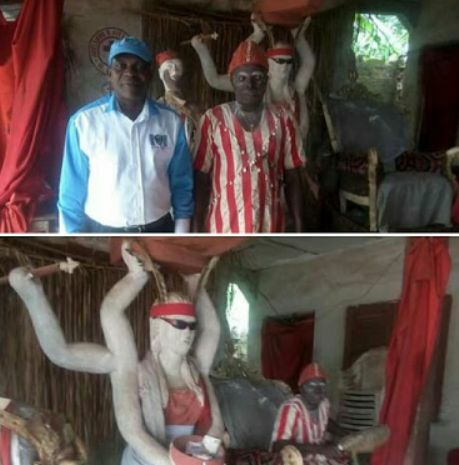 In its effort to curb the menace of trafficking ladies out of the country for s*xual exploitation and other demeaning acts, NAPTIP Benin Zonal office have visited and convinced the chief priests in Ayelala shrines in Edo to stop conniving with Ogas and Madams who bring victims for oath-taking. "It is no secret that one of the control mechanisms employed by traffickers over their victims is the use of voodoo and oath-taking, usually at Ayelala shrines in Edo State. This voodoo is meant to instill fear into them and keep them loyal at all costs," the command said on NAPTIP official Facebook page. "In light of the above, NAPTIP Benin Zonal Command felt the need to sensitize the priests at the shrines, with the aim of enlisting their support to stop this menace. This effort is already yielding fruits as some of the chief priests have turned to anti human trafficking ambassadors."